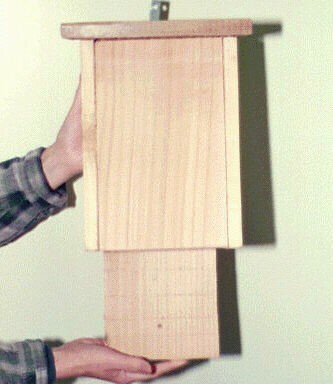 CEDAR BAT HOUSE: Our Small Cedar Bat Houses are made of cedar. The smallest one is a good starter house. It is the same design as the kit. It stands 18" tall, 7 1/4" wide and 6" deep. It will hold 5 to 10 bats comfortably. Seen above in the picture, this design is a very basic house which has been used for a long time. It has two chambers with grooves. These grooves provide notches which enable the bats to hang securely.